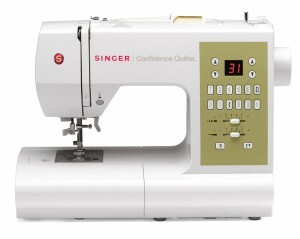 If you think a sewing machine is just some big tool to help you sew, you haven’t experienced the Singer Confidence 7470 Computerized Sewing Machine . Can you imagine 225 stitches, including basic, stretch, alphanumeric, and decorative stitch patterns, in just a single machine? Singer has always been known as a brand that helps people express themselves in creative, albeit unexpected, ways. The Singer Confidence is no exception, but this model ups the ante for even other brands combined. It has a quilt stitch that looks handmade, an alphabet that comes in lower and upper cases, and a temporary memory for up of 20 of the most commonly-used characters like periods after monograms. Realize “what you print is what you sew” with this model’s numerous features. Now you can personalize all kinds of projects with the addition of a name, phrase or monogram with this model’s built-in alphabet in block style. With just the push of the One-Touch Stitch Selection button, you have yourself a stitch and optimum settings for width and length. And there’s no hit-or-miss with its convenient automatic needle threader. The bobbin system is just as “drop and sew” convenience. Just put your wound bobbin into its case, run its bobbin thread through the guide, and the machine draws up your bobbin thread automatically. Even the buttonhole sewing is automatic and an easy one-step procedure, with each side sewn in one direction for beautifully balanced buttonholes. Stitch length and width are adjustable, too. Optimal length and width settings automatically get adjusted as soon as you choose a stitch and even overridden if you wish to personalize a certain length and width. The stitch will always taper to the center instead of to the right or left when you taper with zigzag stitches to give you a sleek, clean look when you taper out of or into a point. Other convenient automatic functions of the 7470 include those for tacking and tie-off. Decorative stitches tie-off with a single button push from four small tacking stitches, reinforcing the beginning and ending of seams with straight stitches to strengthen them and prevent any unraveling. With any select stitch, you have the option of the 7mm-width kind which is bolder and more visible. If a letter or stitch that you have just sewn needs removal, you simply move the cursor button through the 20 spaces of the machine’s built-in memory bank – capable of storing full names and simple phrases with 20 characters – to edit. 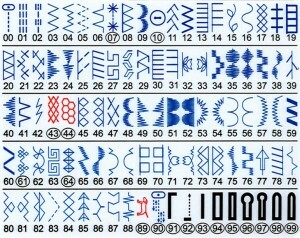 Selecting stitches can be conveniently mirror-imaged for decorative stitching and stitches can be sewn continuously or as one pattern as well. As far as needles are concerned, this model has a twin needle electronic control that makes two parallel stitch rows for a decorative touch, a programmable up and down selection when sewing stops, and 13 needle positions for use in zipper insertion, topstitching, and cording (the down position is best for the needle when you want to stop sewing when doing pivoting, quilting or appliquéing. As to buttons, this model has an exclusive underplate designed for buttonhole sewing that “sandwiches” the fabric between the foot and lower plate to create clean and streamlined buttonholes on multiple fabric layers as well as stretch and delicate fabrics. Non-traditional sizes of buttonholes can be created, too, with long endless sides with the three-step infinite length bar-tack buttonhole. Yet another automatic feature of the Singer Confidence 7470 is that of its presser foot’s pressure control exerted on fabrics against the machine’s feed dogs, enabling you to sew lightweight tricots as well as heavy denims without having to make adjustments. The extra height of the presser foot’s lifter provides more clearance when bulky fabrics of multiple layers are under the presser foot. And speaking of feed dogs, these can be lowered by a lever for attaching buttons, monogram stitching, and free motion embroidery. The box motion of these feed dogs, ensures perfect feeding since the feed dogs remain in equal contact with both the presser foot and the fabric. The automatic tension guarantees straight and stable stitching regardless of fabric type. The 7470’s bobbin system is jam-proofed to preclude thread jamming, because it floats above the hook, even when you sew on sheer or no fabric. Additionally, the needle bar disengages automatically as the bobbin winds to make bobbin winding faster and more convenient. The electronic formation of stitches is digital to control stepper motions for perfectly-formed patterns every time. If you forget patterns, by the way, your Singer Confidence won’t. Just select a pattern and override the length and width and the machine “memorizes” what you changes you made. You can choose another pattern and return to the pattern that was overridden and the settings will remain in place for as long as you don’t turn off the machine. The Singer 7470’s (learn more) LCD provides you with a clear screen so you can view the stitch patterns – including the stitch length and width – in perfect clarity and well-illuminated with two long-lasting LED StayBright light bulbs that will not overheat regardless of how long the machine runs. These bulbs are capable of providing 100,000 hours of bright light for you when you sew. All of these features are rigidly supported by a metal frame designed for heavy duty performance to hold up all mechanism in alignment for skip-free sewing every time. And to prove the durability of the 7470, Singer has provided this model with a 25-year (limited) warranty inclusive of electronics (five years) and labor (one year). Sewing through multiple fabrics, from six to eight layers, is a breeze because of its Optimum Power control system that acts as a sensor when additional power in terms of speed is needed when sewing thick fabrics or changing their conditions. As to your array of accessories, they can be stored on board to make accessibility to them easier. Sewing area is large enough for working on larger projects. Work space is well lit. Sewing machine has solid construction for handling the thickest of fabrics. Drop-and-sew bobbin mechanism is convenient. Wide range of embellishment options. Detailed and easy-to-understand instruction manual. Automatic tension feature is very helpful. Excellent sewing machine for those who want a lot of details such as embroidery or monograms on their projects. Machine weighs heavier than expected. Automatic threader may be difficult for some to use. Size of embroidery stitches is small. Some customers felt that the lighting is unable to provide sufficient illumination. While the machine is compatible with a twin needle, this has to be bought separately since it doesn’t come with the machine’s purchase. 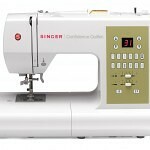 If you do a lot of quilting you may want to consider the Singer Quantum Stylist Sewing Machine. It is more expensive, but the extra investment is worth it if you are planning on quilting often. For all other types of sewing, including apparel, home décor, upholstery, embroidery, and monogram, consider the Singer Confidence Sewing Machine . It is a perfect beginner quilting machine because it is easy to use, inexpensive and comes with a lot of great features.